We were thrilled to celebrate the grand opening of Syngenta‘s new Digital Innovation Lab at University of Illinois Research Park today! 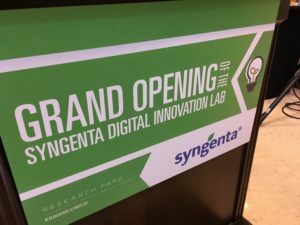 The Syngenta Digital Innovation Lab in Champaign serves as an incubator for new ideas that address the goal of feeding the world’s burgeoning population. They are part of an ecosystem of digital innovation labs developing tools and technologies for Syngenta’s worldwide agricultural operations. In this collaborative and dynamic environment, they encourage “out-of-the-box” solutions that challenge the status quo. Champaign, IL— February 23, 2017 — Syngenta today announced it has established a Digital Innovation Lab at the University of Illinois Research Park where it will employ four full-time employees as well as University of Illinois at Urbana-Champaign student talent to help solve agricultural challenges. Projects at the Digital Innovation Lab will employ “outside the box” thinking with access to tools, technologies, partnerships and resources that enable the research, investigation and delivery of new and novel solutions for seeds product development using data analytics. “Innovation in agriculture is the lifeblood of the work we do at Syngenta. Our goal is to bring new talent to solve difficult challenges, with a focus on seed innovation at the Research Park,” said Bill Danker, Syngenta Domain Head, Seeds Research and Breeding. The center will focus on digital data innovation and strategy, providing Syngenta with agile capabilities to enable the company to accelerate the pace of its digital journey. It will foster new ways to gain insights and make decisions from the company’s data assets. The center will develop capabilities in breeding engineering, digital agriculture, information technology, application development and big data. In conjuction with the opening of the new office, Syngenta has an industry partnership with the National Center for Supercomputing Applications (NCSA) at the University of Illinois at Urbana- Champaign. This partnership enables Syngenta to leverage the NCSA’s unique expertise in high-performance modeling, simulation and big data to gain a competitive edge. will work on developing projects using technologies such as smart farming, mobile applications, cloud services, and big data. “Digital innovation and integrating our data for greater insight is becoming a critical part of how we invent and bring new products to market, and support them in the market. This new capability will add creativity to the way we approach digital innovation,” said John Ormrod, Syngenta Head IS Global R&D. Student hiring is underway with the goal to be fully operational by the summer. The University of Illinois is a world leader in research, teaching and discovery. Distinguished by the breadth of its programs, broad academic excellence, and internationally renowned faculty, the University of Illinois has a commitment of excellence in teaching, research, public service and economic development. The University of Illinois at Urbana-Champaign serves the state, the nation, and the world by creating knowledge, preparing students for lives of impact, and addressing critical societal needs through the transfer and application of knowledge. The Research Park at the University of Illinois at Urbana-Champaign is a technology hub for startup companies and corporate research and development operations. Within the Research Park there are more than 100 companies employing students and full-time technology professionals. More information at researchpark.illinois.edu. The National Center for Supercomputing Applications (NCSA) provides computing, data, networking, and visualization resources and expertise that help scientists and engineers across the country better understand and improve our world. NCSA is an interdisciplinary hub and is engaged in research and education collaborations with colleagues and students across the campus of the University of Illinois at Urbana-Champaign. For more information, see www.ncsa.illinois.edu. View photos from the grand opening event here.